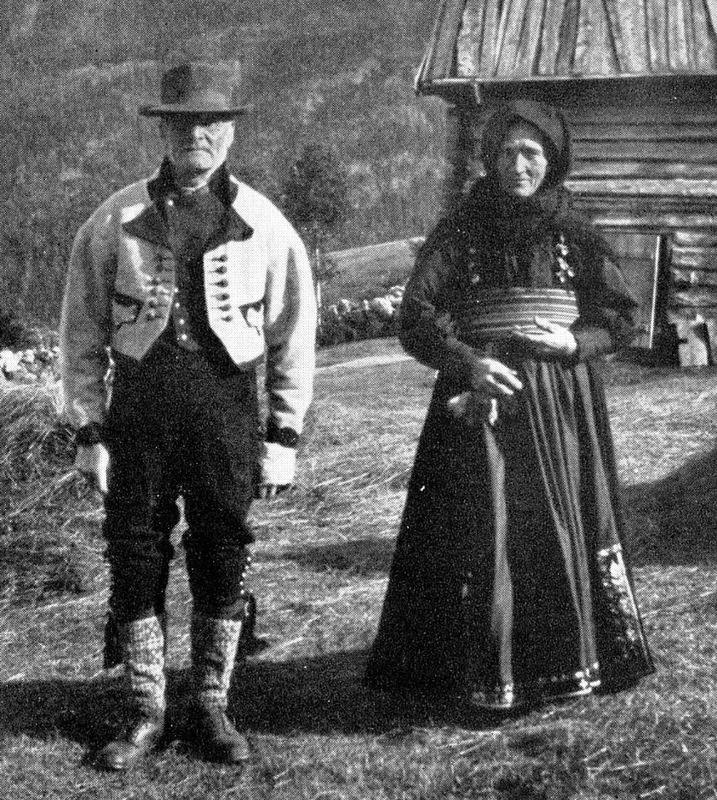 Today I will continue my series on the East Telemark costume by describing the Gråtrøje costume, the men's folk costume of the 2nd half of the 19th cent in East Telemark. 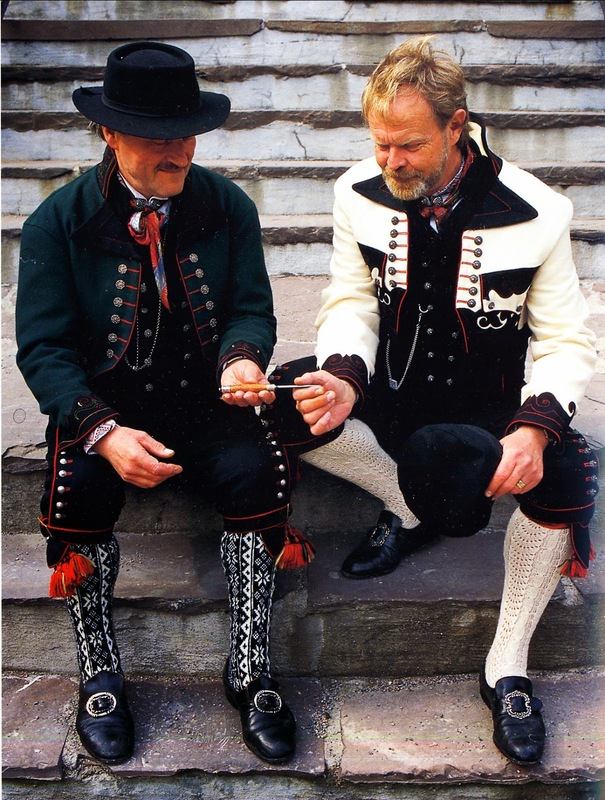 This is the most popular of the three versions of that costume today, and is often thought of as THE men's costume of Telemark. 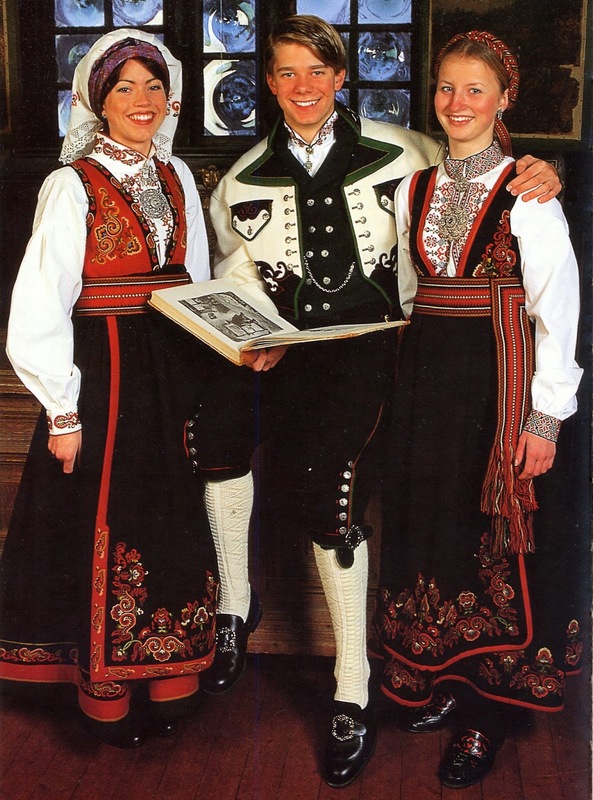 You can see it illustrated above, this young man in the Gråtrøje is flanked by two young women in the revived Raudtrøje costume. 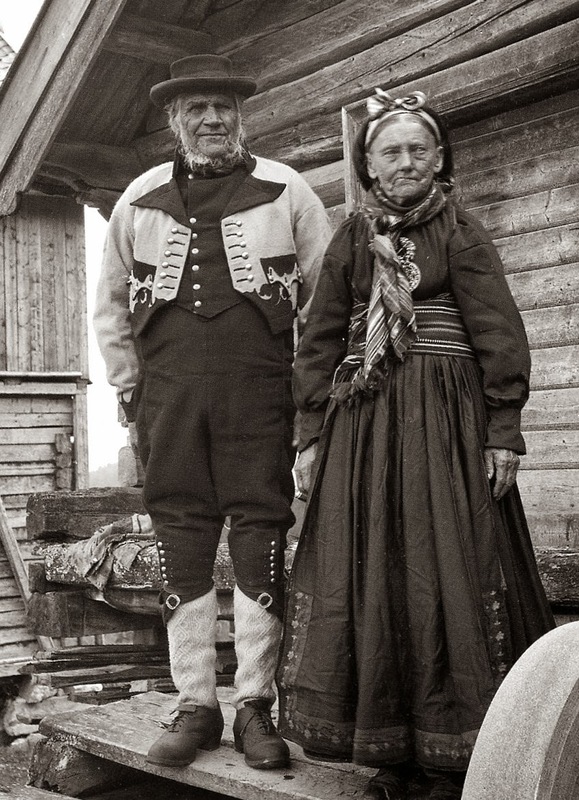 To be historically correct, the Gråtrøje should be paired with the woman's costume Beltestakk. 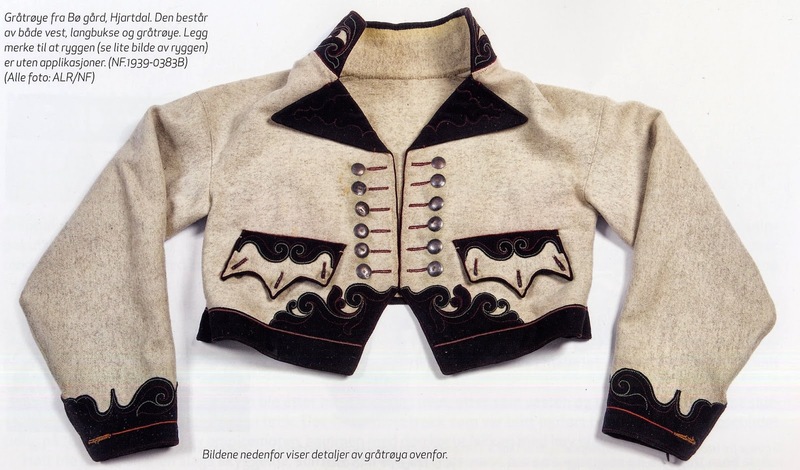 Gråtrøje literally means 'Gray Jacket', and is named after the distinctive jacket which forms the most unique part of this costume, which is traditionally made of natural unbleached wool. 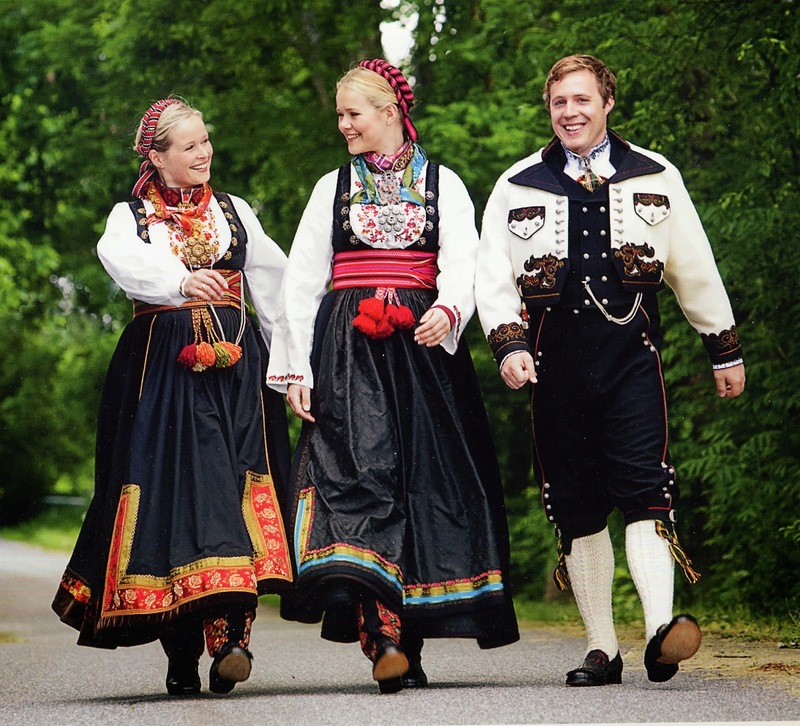 The shirt, skjorte, is traditionally of linen, but today sometimes of cotton. 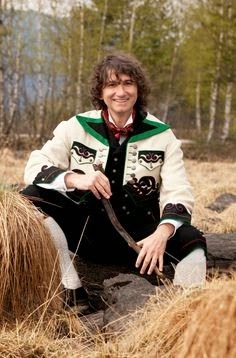 The cut is essentially the same as the women's shirt, but generally longer, see my previous article. 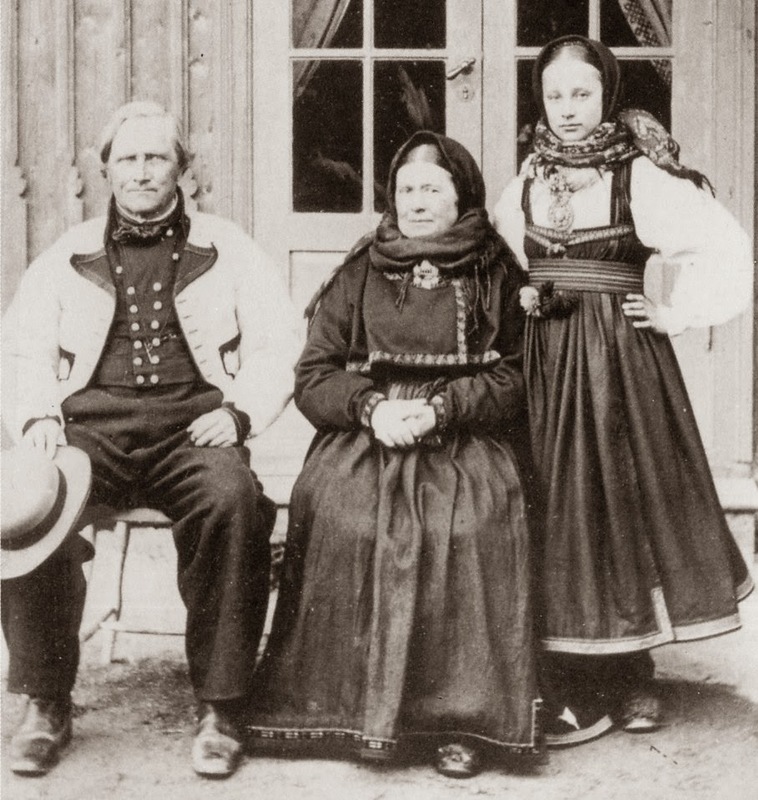 Most of the time it is not embroidered, but as you can see from this image above, sometimes the collar and cuffs are embroidered in a manner similar to the women's shirts, most commonly in cross stitch. 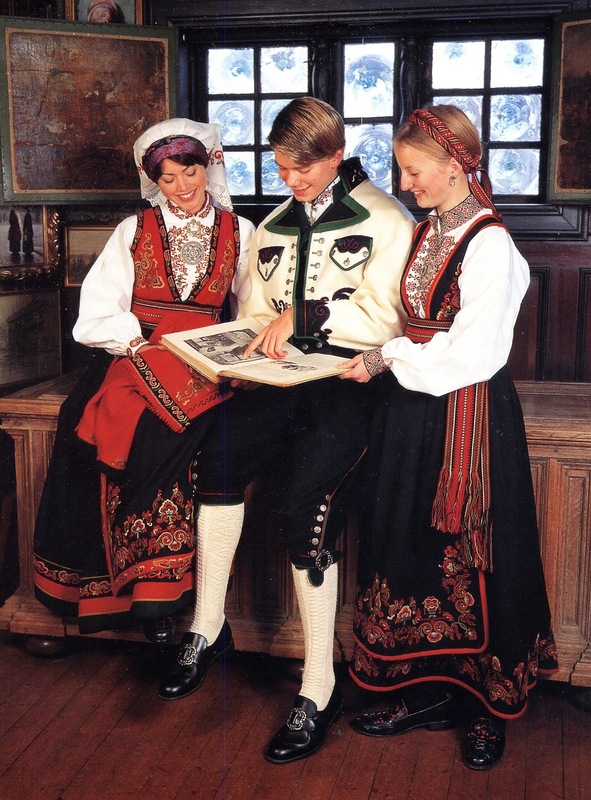 The earlier costume had extensive embroidery on the shirts. Here are some possible embroidery designs for the shirt. 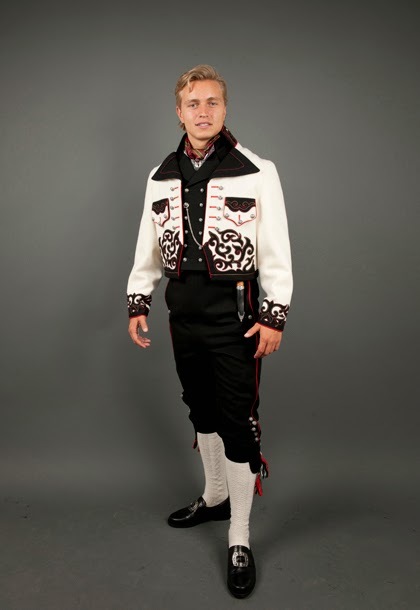 Today either knee breeches, knebukse, or long pants, langbukse, are worn with this costume. 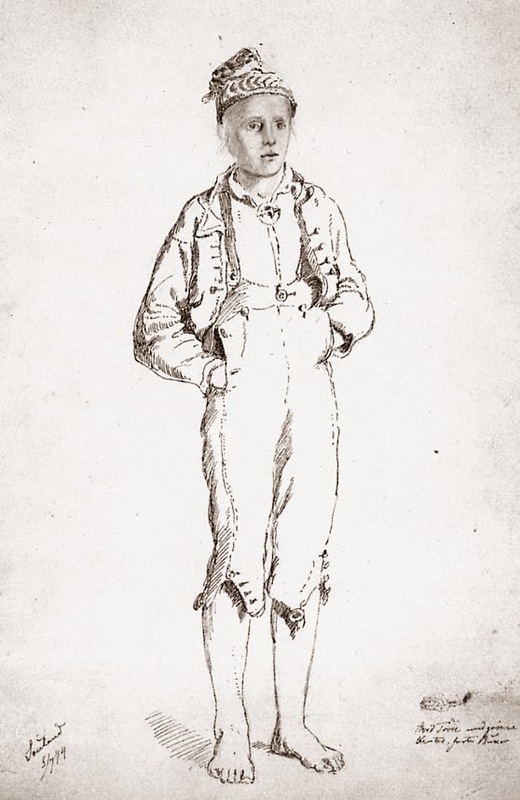 Both were in fact known in the 19th cent., the long pants being more common in the latter part of that century. 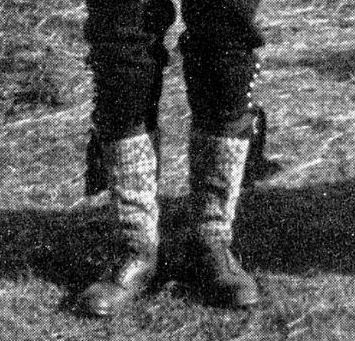 Both the long pants and the breeches are of black vadmal and are high-waisted. 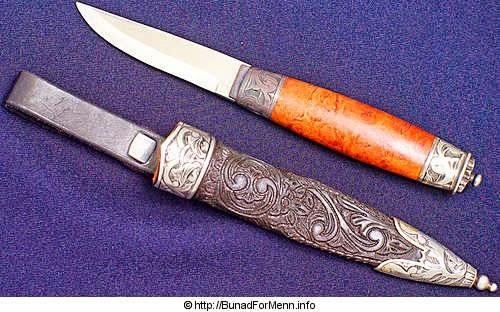 This became more pronounced towards the end of the 19th cent. 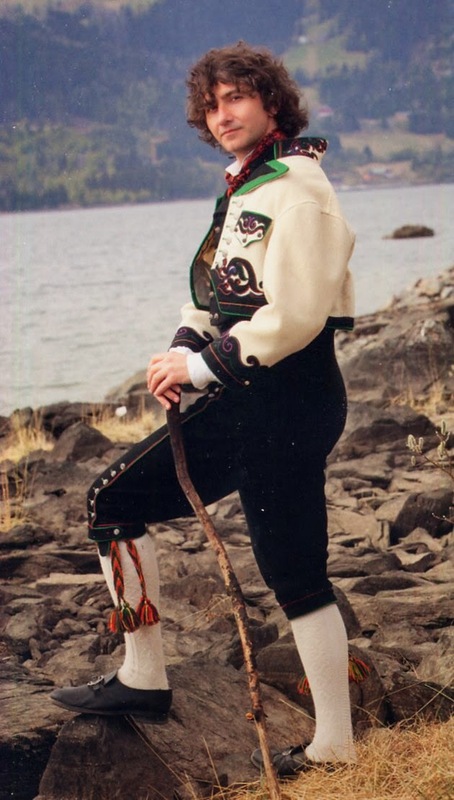 under the influence of Empire Period fashions. 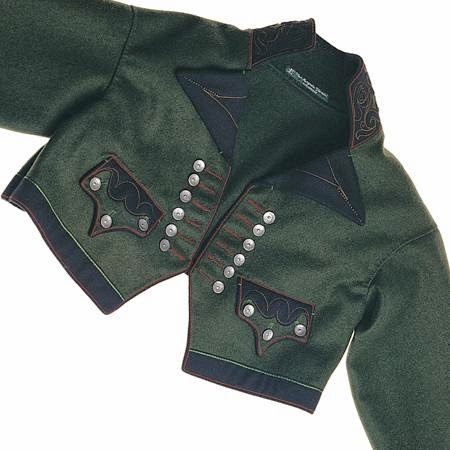 The breeches have a fall front, and are ornamented with many silver buttons and red or green piping. 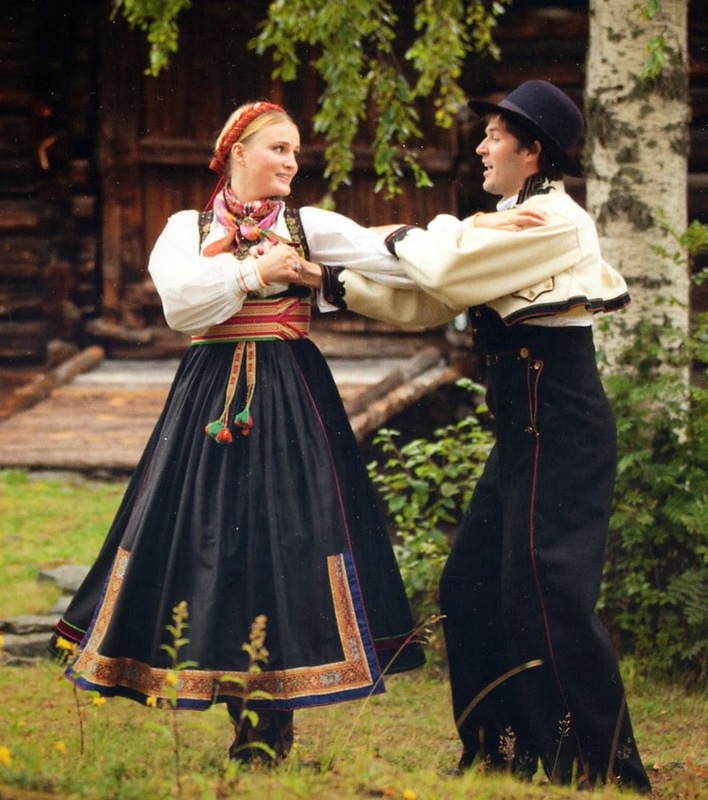 As you can see from the two images above, the long pants may also be so ornamented, or may be plain black. 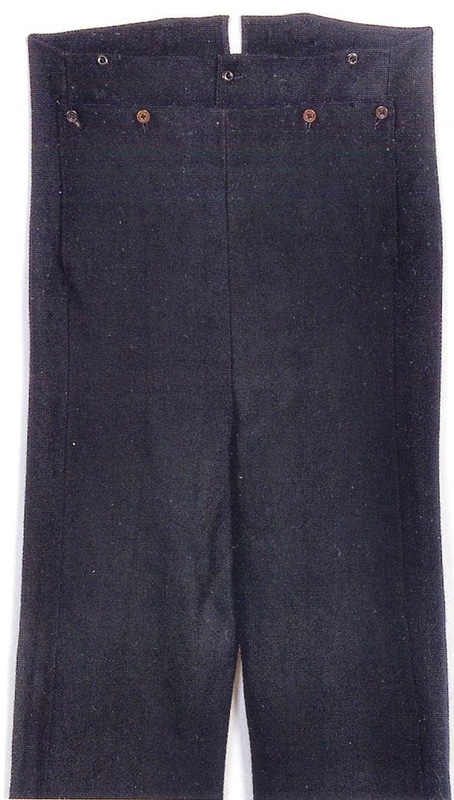 Long pants. These tend to be plainer. 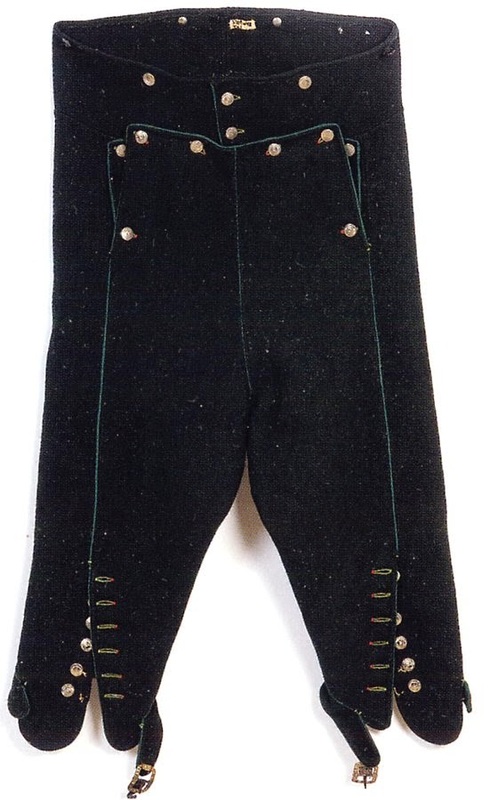 All forms of these pants are supported by braces. Notice that each example above has buttons to attach to the braces. 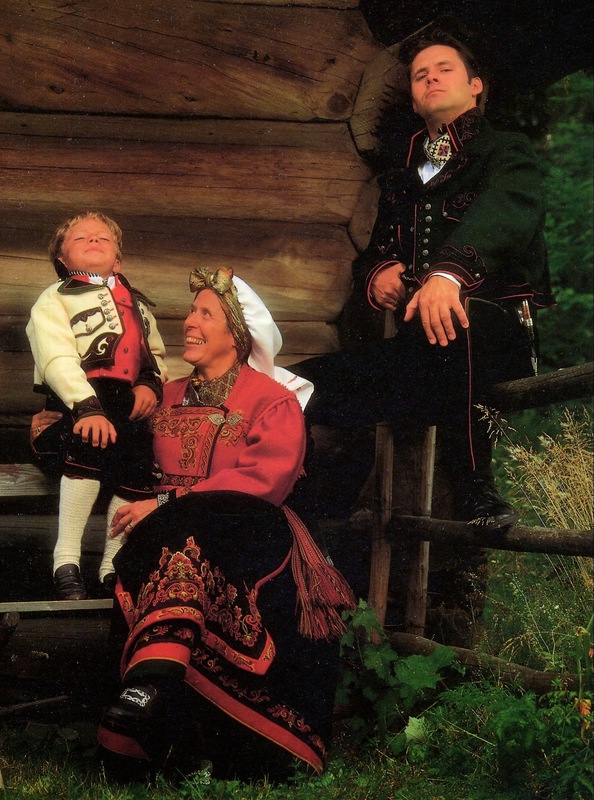 Unless you are going barefoot, as this boy is doing, knitted knee socks, stromper, are worn. 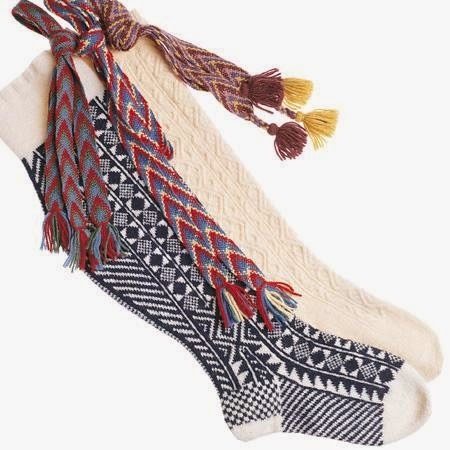 These are either white with a knitted-in texture, or knitted with a black and white design. 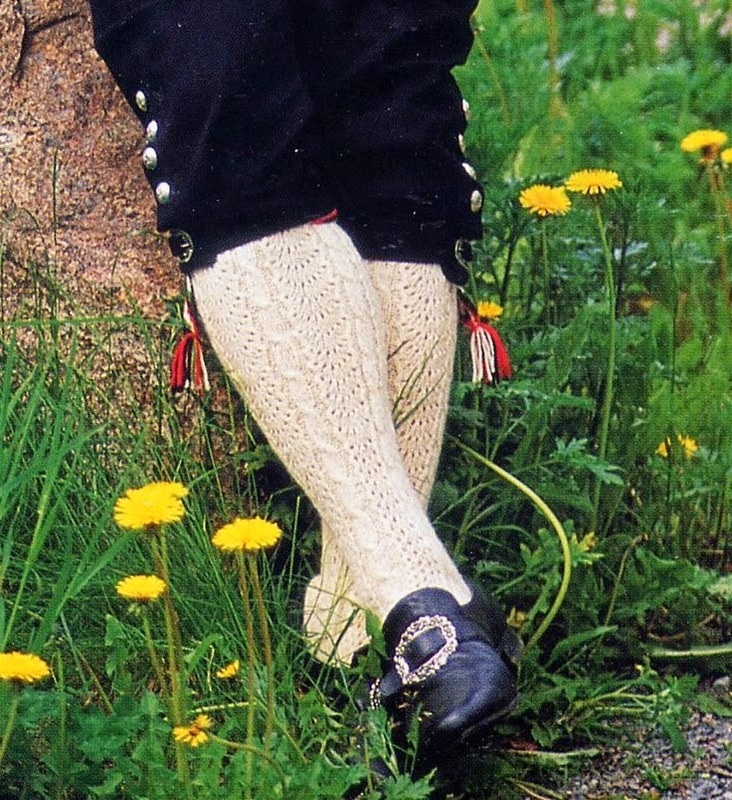 Finger woven [braided] garters, sokkebande, are always worn with the knee socks. 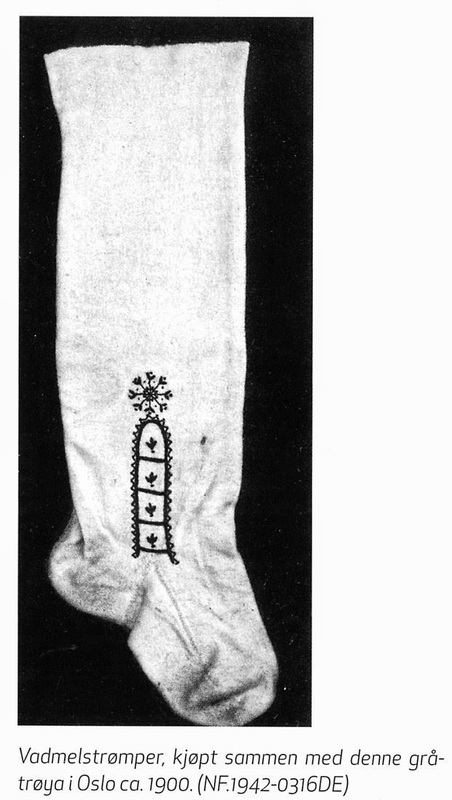 They are not merely ornamental, but serve a practical purpose in holding the socks up. 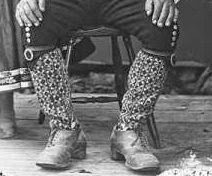 They are tied around the leg above the calf, and the ends are left to hang on the outsides of the knees. 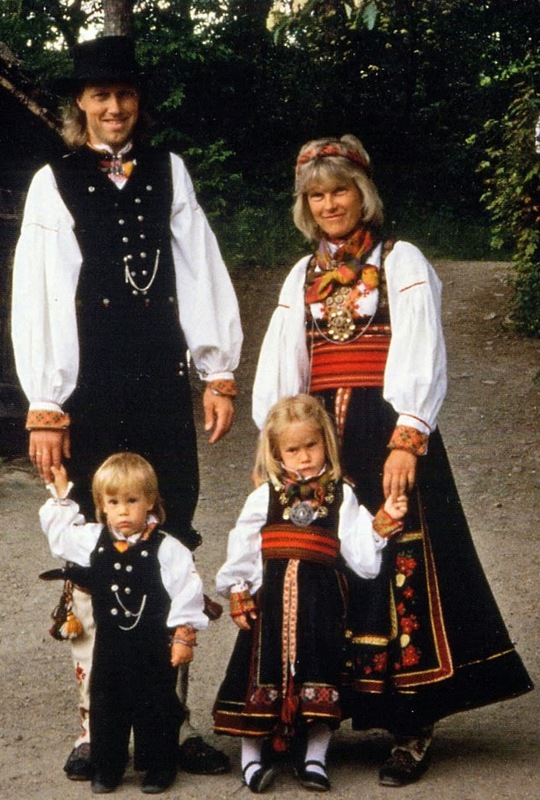 They are generally braided in two or more colors in stripes, as shown here. 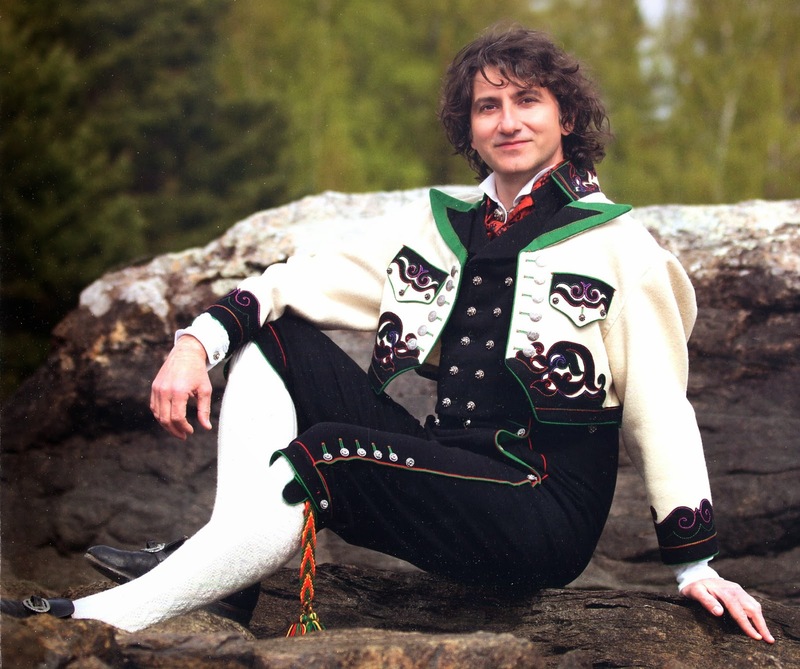 The older costume, Snippekufte, had woven vadmal stockings which were embroidered, as did the women's costume. 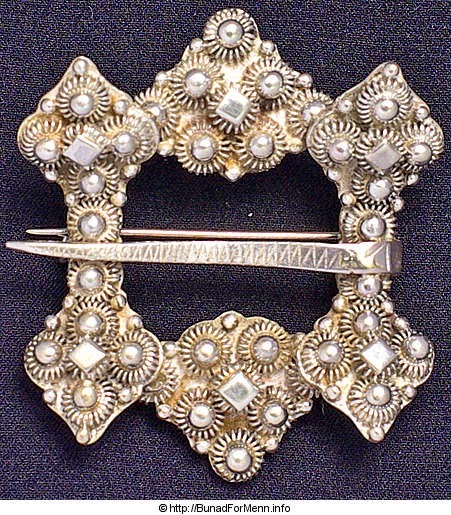 These were rarely worn with the Gråtrøje, but here is one example from 1900. 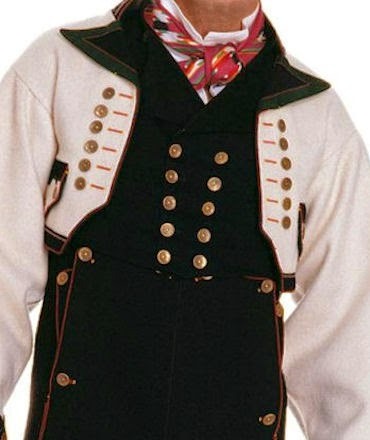 Vests are worn over the breeches and braces. They are either black or dark green, have a standing collar and are double-breasted. 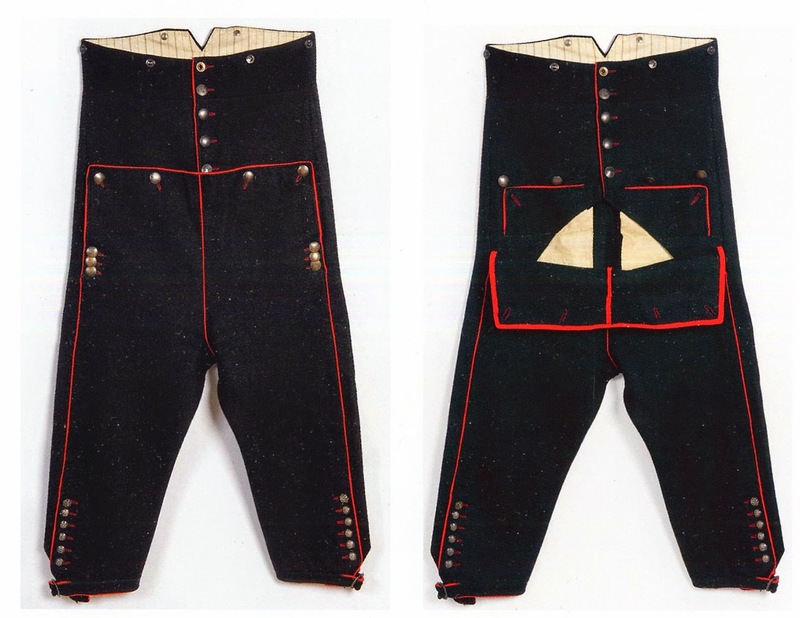 They tend to be short, but the exact length depends on how high-waisted the breeches are, overlapping the breeches by a couple inches.Take a look at the various images in this article and you will notice that while modern examples have the two rows of buttons parallel, the older examples have them in somewhat of a V. Also, in the old examples the tops of the vests were buttoned up, and today they are folded down to make lapels. 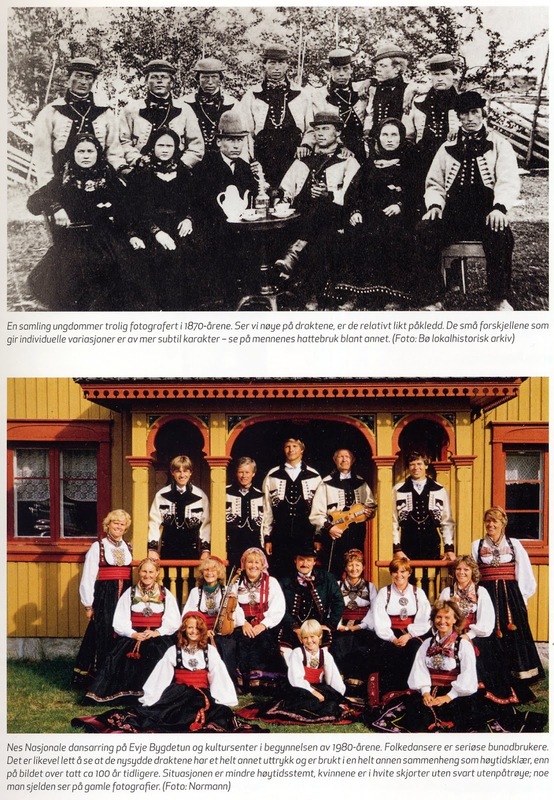 Here are two photos of local groups taken 110 years apart, the first photo in 1870 and the second in 1980. Take a moment to look at the similarities and the differences. 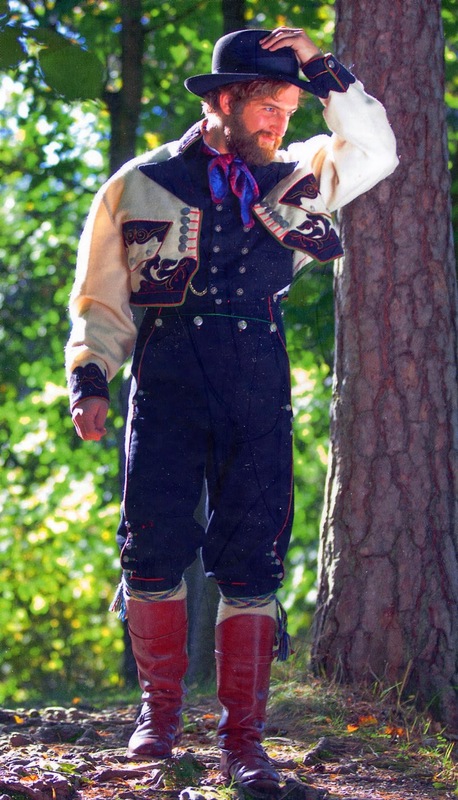 The jacket is the most distinctive part of this costume. 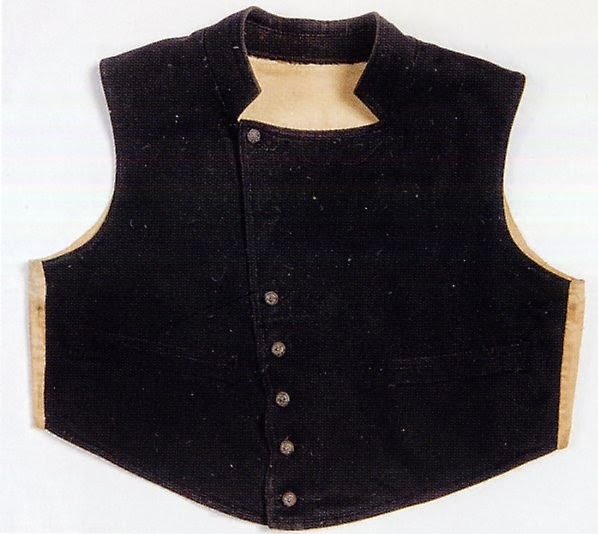 Like the vest, it varies somewhat in length, depending on how high-waisted the breeches are. 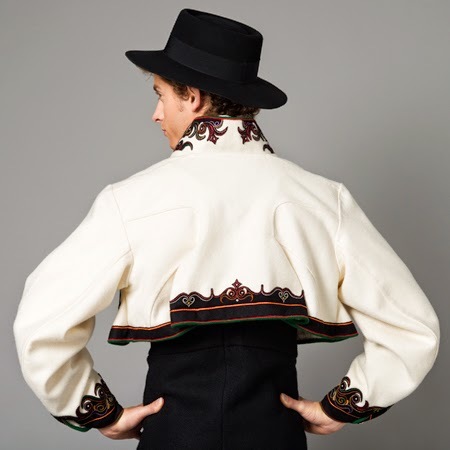 It is similar in cut to women's jackets of the region, except in opening down the center front, having a high standing collar and long pointed lapels. 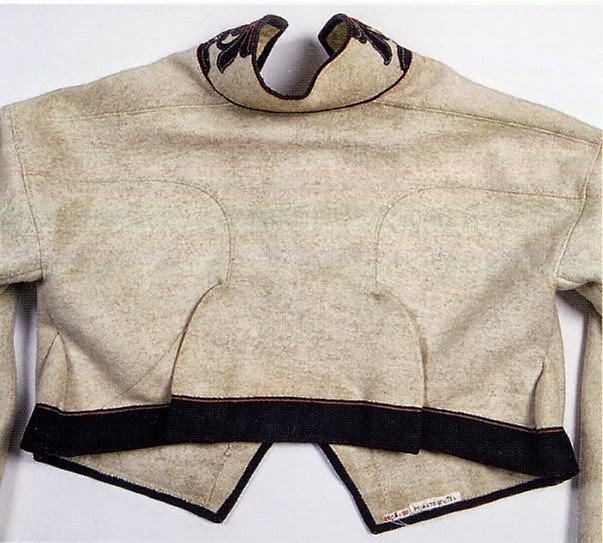 The base color is the natural offwhite color of sheep's wool. 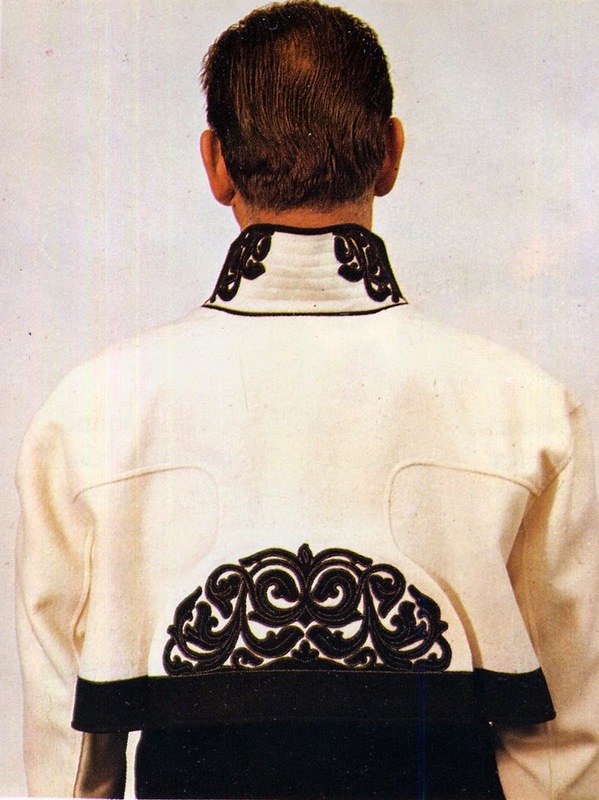 There is a row of buttonholes and buttons down each side of the front opening and appliqued decoration on the collar, cuffs and pocket flaps. 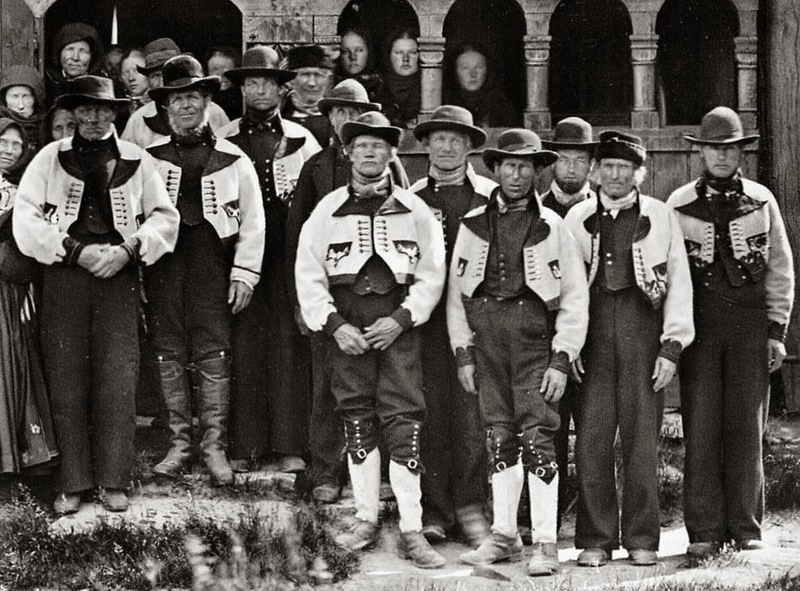 Here is an old photograph in front of a church. 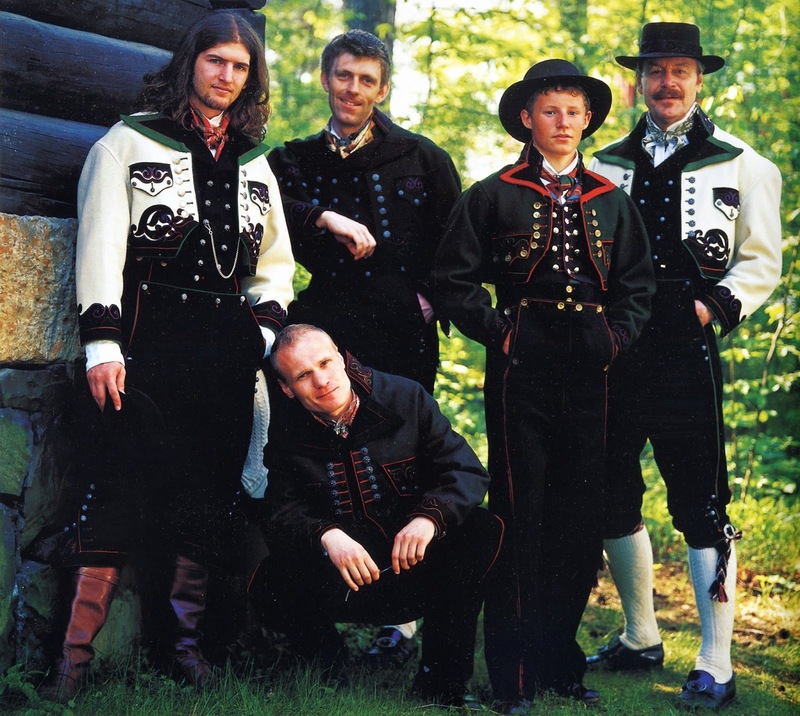 If you look carefully at the two men on the far right, you will see that their jackets have extra ornament. 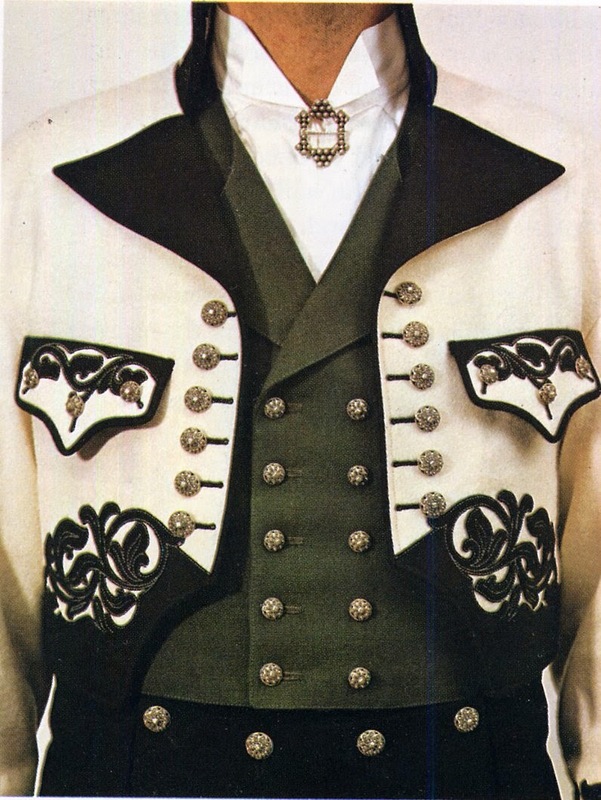 The older form of the jacket was plain on the lower front corners and back, like this example. 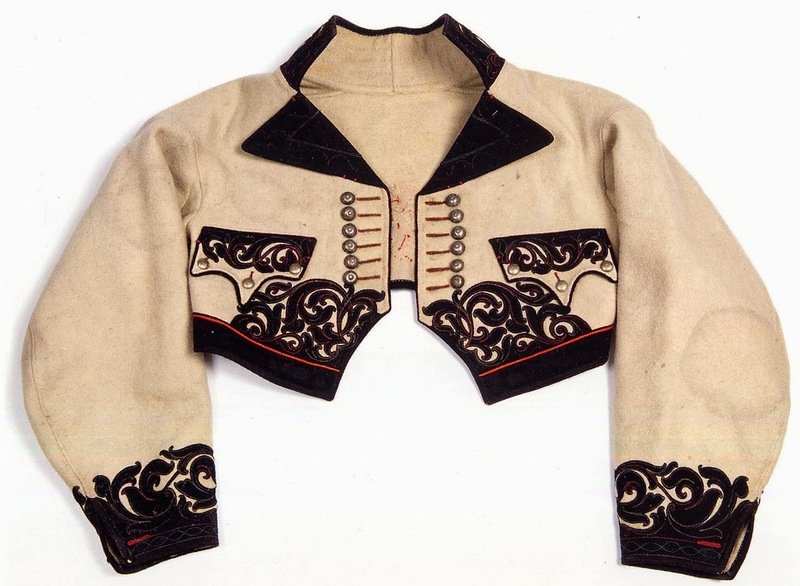 Tailors later added scrolling rococo applique to these areas. 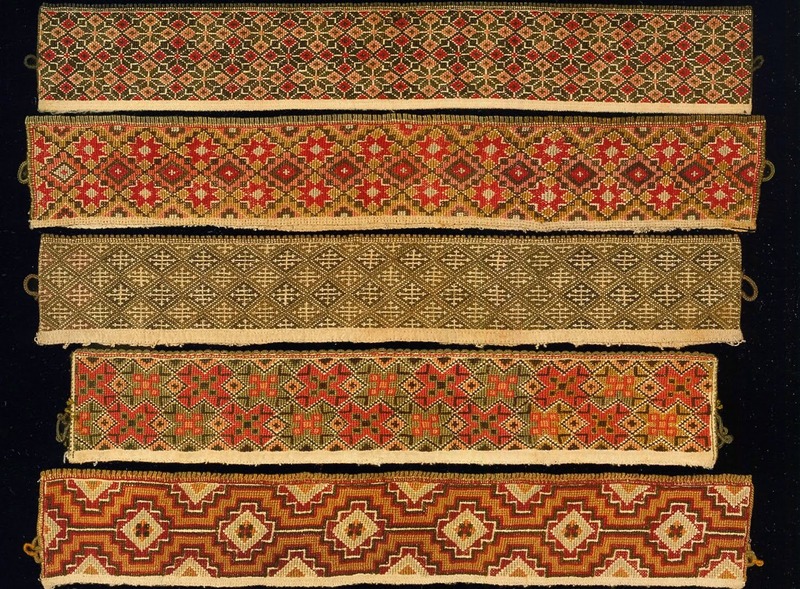 This was combined with topstitching in various colors. 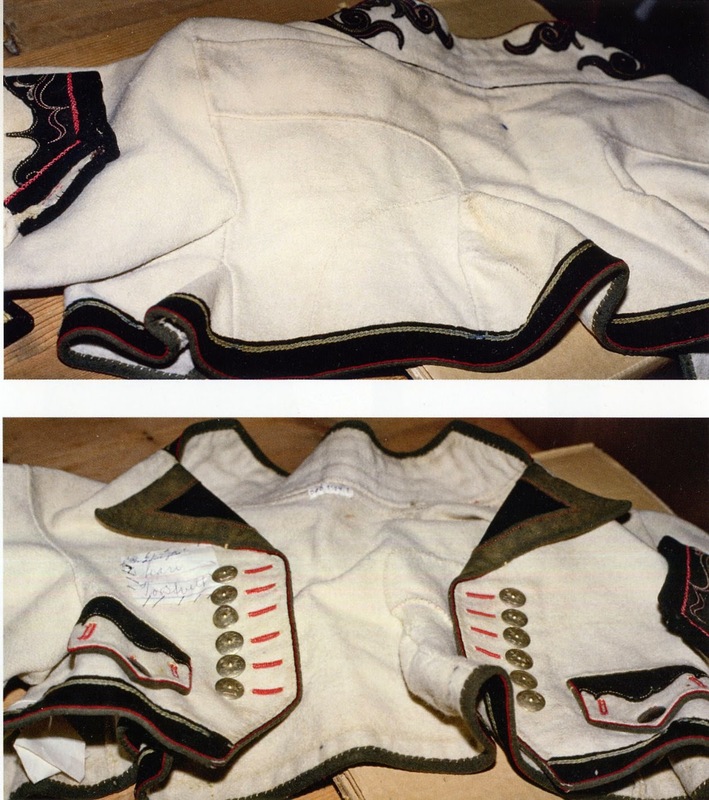 Although these jackets look basically similar, close examination will reveal different patterns in the applique. 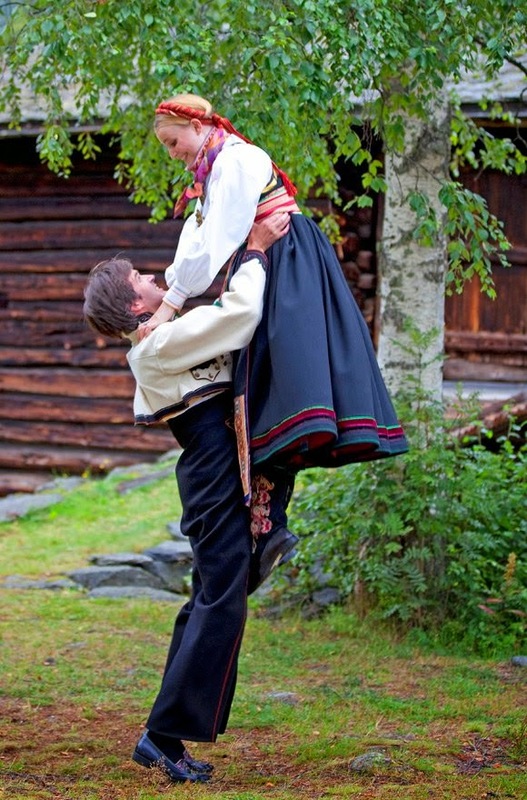 Take a look through the images in this article. 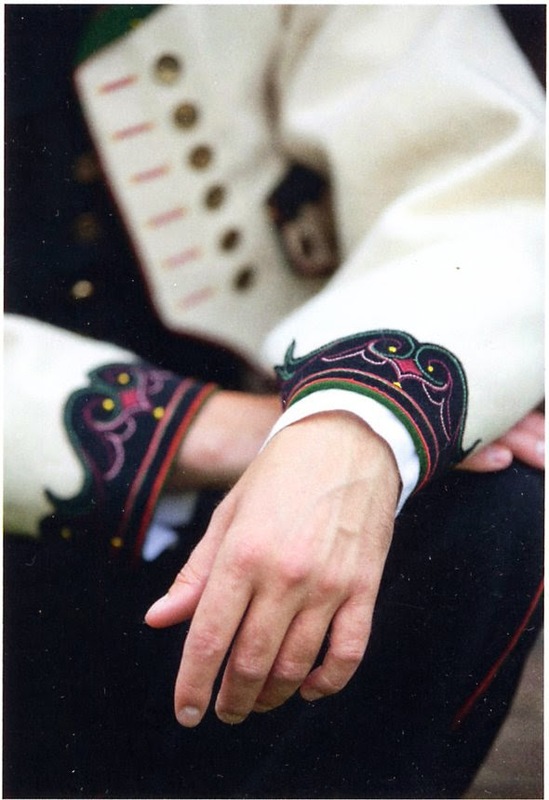 Here are closeups of a few of the jackets. 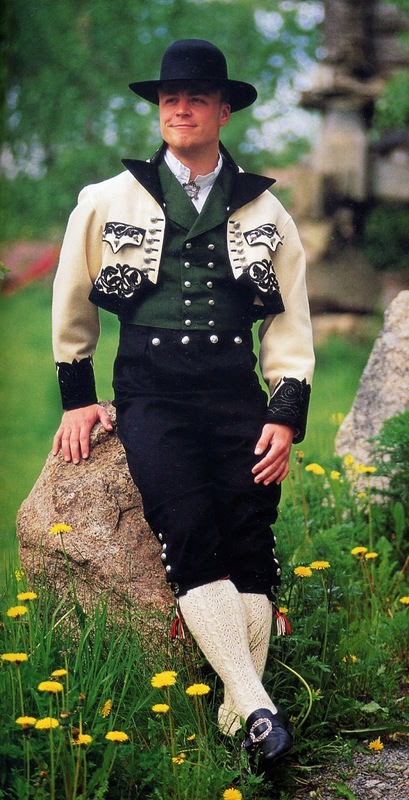 A second variant of this jacket exists from Heddal, in which the ground color is dark green instead of white/gray. 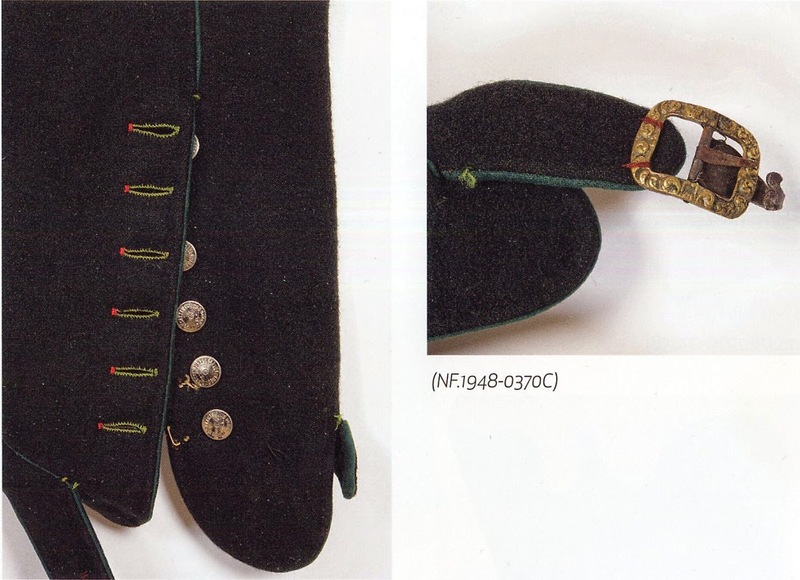 Footwear consisted of various types of sturdy shoes with laces or buckles, or even occasionally boots. 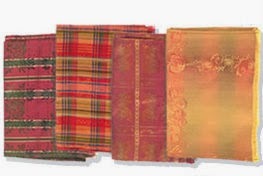 As with the women, silk kerchiefs in verious colors are tied around the neck. Hats are of two kinds. 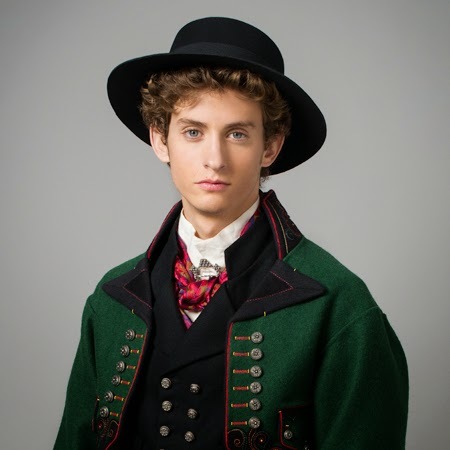 For more formal wear, round felt hats are worn. 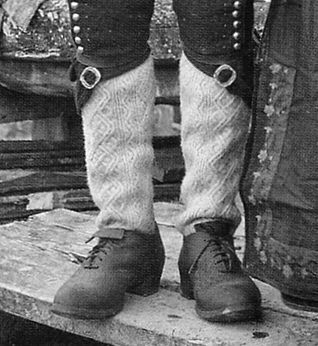 for more everyday occasions knitted stocking caps are worn. 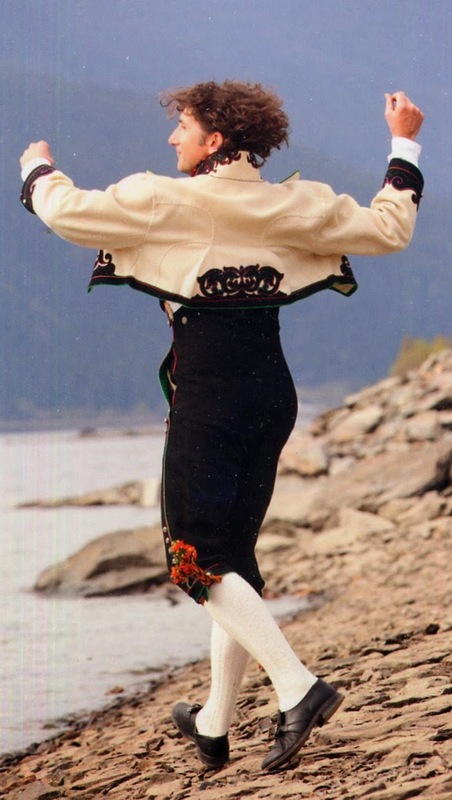 These have a band of fleecy loops around the edge, and are similar to those worn in neighboring Setesdal. 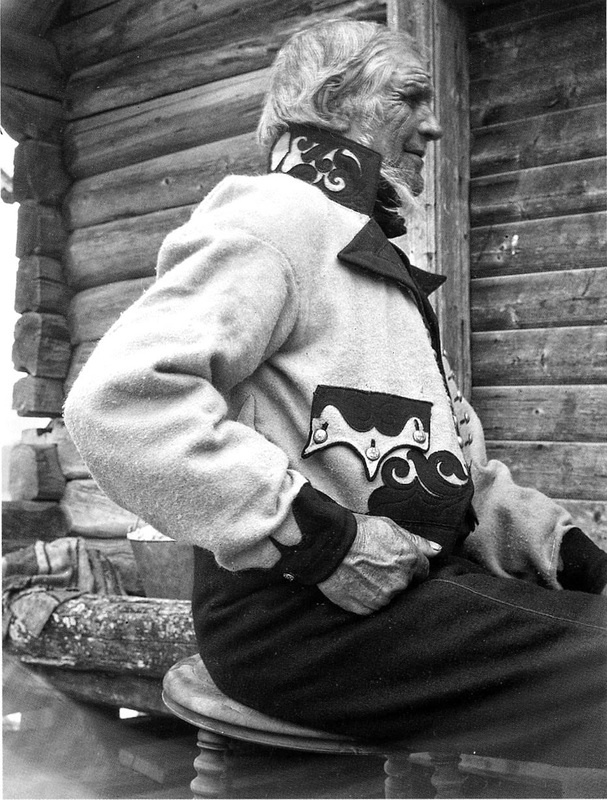 The silver for this costume consists of cufflinks, collar button, watch chain, a knife which hangs from the waist and the numerous buttons on the garments. 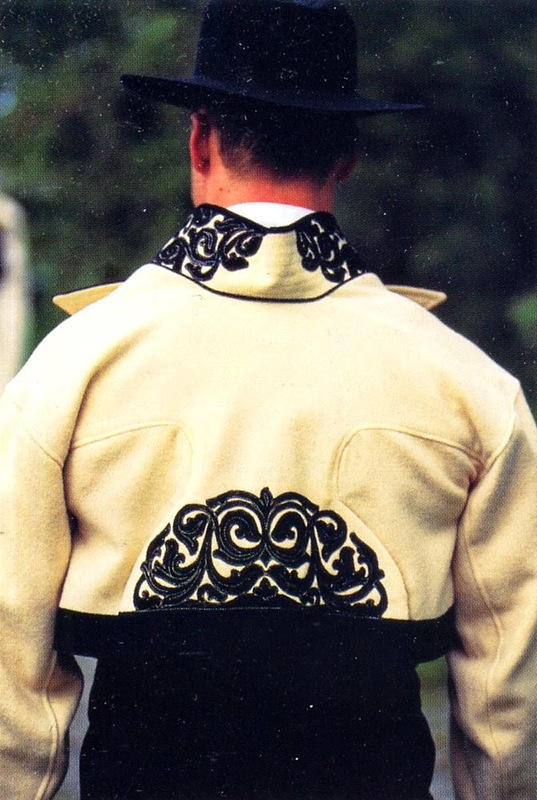 A particular square filligree collar button is unique to Telemark.